New Care is proud of its long-standing partnership with Oomph, the UK’s leading wellbeing business for older adults. Together we aim to enhance the mental, physical and emotional wellbeing of all residents living in one of our stunning ‘new generation’ care facilities. Through the provision of innovative exercise, a variety of activities and engaging trips outs, we can positively encourage a full and active life for all, regardless of age and ability. As part of this partnership, we host a monthly golden ticket draw at each of our care facilities, rewarding a member of the team for a ‘special staff and resident moment’. From making a residents’ wish come true through organising a special activity to simply spending uninterrupted quality time with a resident listening to their stories, lots of special moments take place within the home, all of which are worthy of recognition. This month, we decided to host a very special Willy Wonka-themed Golden Ticket sweepstake, with some superb prizes up for grabs for the lucky team member. In Nottingham, Amy Simpson (wellbeing coordinator) at Ruddington Manor won an Apple Watch whilst Frankie Walsh (wellbeing assistant) at The Grand won £500 worth of gift vouchers. In the North West, Malcolm Angus (care assistant) at Ashlands Manor in Sale won a 50” Smart TV, Ammaarah Issat (care assistant) at The Hamptons in Lytham St Annes won an Apple Watch and Steve Davies (maintenance manager) at Grosvenor Manor in Chester won £500 worth of gift vouchers. 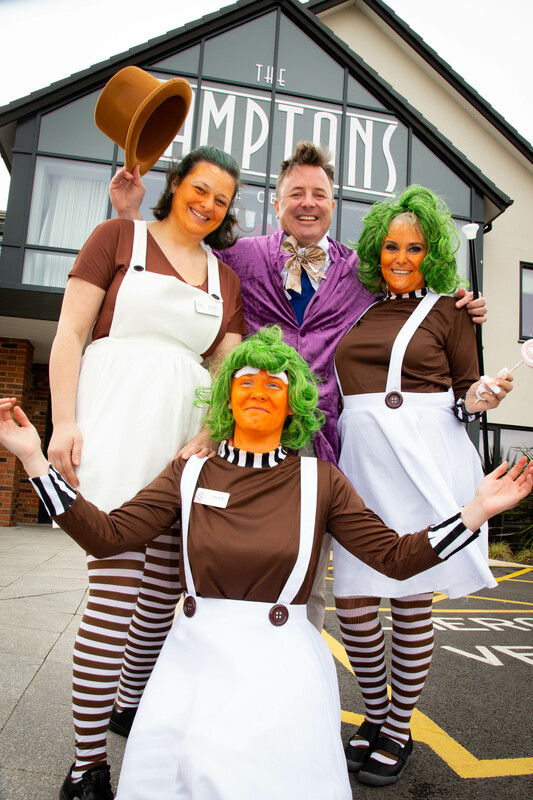 New Care’s Chairman, Dominic Kay aka Willy Wonka, personally visited each home to pick at random the winners and present each of the lucky team members with their prizes. Supporting Dominic were the care home managers, who either dressed up as an Oompa Loompa or enlisted the help of one of the staff.